Walk. Sew. Good. news, that is. Amid all the global doom and gloom (you know who what I’m talking about) and personal trials and tribulations (the latest of which was being made redundant) of the past weeks, there’s still stories that give us hope for the human race. I got to hear one of them when I met this lady last week. 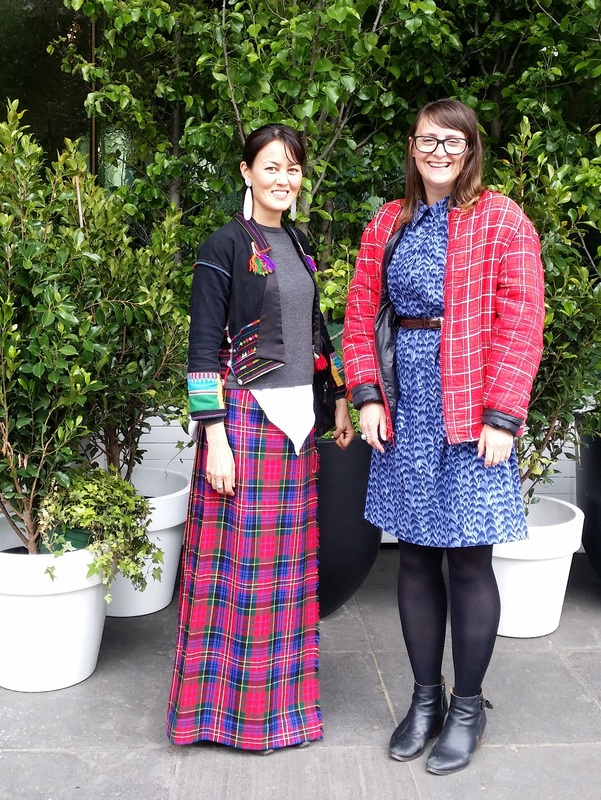 Now, if the fact that we were both wearing tartan didn’t already create a common bond, our interest in sustainable fashion did. However, my own efforts to further the cause (which in recent years have mainly consisted of trying to convince people that 1. opshops don’t smell funny and 2. they should read my blog and get some DIY inspo.. oh, and writing for Peppermint) pale in comparison with what Megan and her friend Gab are going to do – namely, spend a year crossing four countries in South East Asia on foot in pursuit of positive fashion stories. Yep, you can sit at home and whinge about the state of the world or you can convince a friend to join you in learning how to make short films, crowdfunding and then pulling on a massive backpack and trekking through Vietnam, Cambodia, Thailand and Laos. The latter is what Megan has done since becoming outraged about the various injustices in the fashion industry such as unfair and dangerous conditions for workers in garment factories. She and Gab have already met some people contributing to positive change in the fashion system and shared their stories on the Walk. Sew. Good website. They’ve also lined up other people to catch up with across South East Asia and will be posting stories as they travel, with their departure scheduled for this week. Make sure to check in on them occasionally to find out who they’ve met – and how their feet are faring! I honestly did not know Megan was going to wear tartan, so this really was a coincidence. 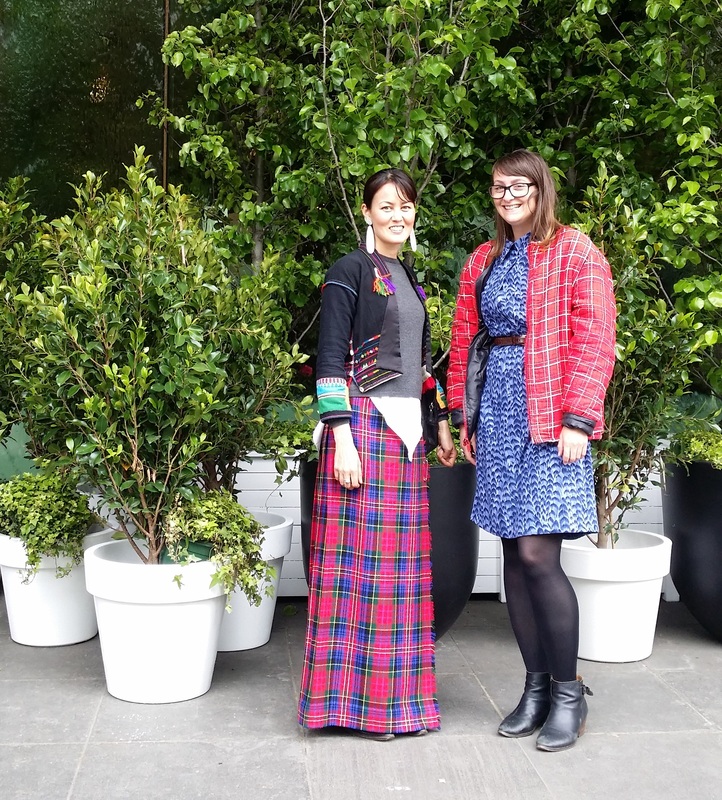 However the Akha jacket I’m wearing was an intentional styling choice – I bought it from an Akha lady at a market when I did a trek in Laos a few years ago so it seemed fitting to wear it to meet someone who was about to walk through similar parts of the world. My trek was only three days long though! What an incredible adventure! You’re right – this is exactly the sort of news we need to hear (and follow) in light of certain climate change deniers being voted into certain positions of power in certain significant countries. your outfit here is amazing- your eye for having put that jacket with that skirt… you have a talent!